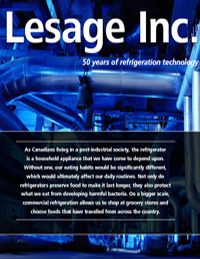 Home | Business in Action | October 09 | Lesage Inc.
As Canadians living in a post-industrial society, the refrigerator is a household appliance that we have come to depend upon. Without one, our eating habits would be significantly different, which would ultimately affect our daily routines. Not only do refrigerators preserve food to make it last longer, they also protect what we eat from developing harmful bacteria. On a bigger scale, commercial refrigeration allows us to shop at grocery stores and choose foods that have travelled from across the country. For over 50 years, Lesage Inc. has propelled the commercial refrigeration industry to keep Québec residents coming back to their local food markets. Located in Laval, Lesage was founded in 1953. What started out as a small company steadily progressed to reach its current size. Each year, Lesage would hire an average of two employees , as well as add a service vehicle to its fleet. Today, the company has 115 employees, including 80 technicians who specialize in commercial and industrial refrigeration. As for the fleet, there are over 50 trucks to ensure prompt and efficient service to all customers. Lesage offers a wide variety of services, making them a convenient one-stop-shop for commercial and industrial clients. Because refrigeration is the sort of technology that needs to be running constantly, the Lesage team makes itself available around the clock— 24 hours a day, seven days a week. The company understands that immediacy is paramount when it’s a large quantity of food—a grocer’s literal bread and butter—hanging in the balance. Lesage also realises that these emergencies can often be prevented with regular check-ups, which is why they provide a contract of service and preventative maintenance. Along with servicing existing refrigerators, Les age also sells refrigeration equipment that is customized to suit the particular needs of the customer. In fact, the company is continuously developing new technologies and design concepts, as well as supporting its engineers. In today’s marketplace, a variety of systems are currently used in commercial and industrial sectors. Examples include central refrigeration systems connected to food display cases, selfcontained display cases and walk-in refrigerators and freezers. New to the industry are designs known as ‘distributed systems’, which are also being used to place refrigeration compressors and associated components near the display cases that are being refrigerated. There are also ‘indirect systems’ where a primary refrigeration system cools a secondary fluid, which then circulates through a secondary loop to the display cases. In each case, the choice of refrigerant will depend on the specific requirements of the application. Lesage believes in evolving with the industry and responding to the consumers’ expectations. In recent years, environmental trends have changed the way consumers consider their purchasing decisions. For Lesage, sustainability and efficiency are top-of-mind for the team. 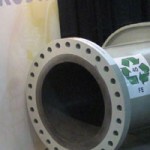 Their offerings include heat recovery and improving energy efficiency, for both new and existing units. To be fair to the refrigeration industry, companies like Lesage have been interested in the environment for a while now. Since the mid-1980s, commercial refrigeration systems have undergone a transition from using ozonedepleting refrigerant compounds, including chlorofluorocarbons (CFCs), to low- or non-ozone depleting compounds, such as hydrochlorofluorocarbons (HCFCs) and hydrofluorocarbons (HFCs). 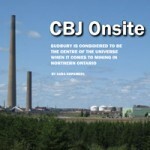 The harmful chemicals—ammonia, hydrocarbons and carbon dioxide— are being used to a lesser extent. Unfortunately, while HFCs don’t harm the ozone, they are considered to have hundreds of times more global warming potential, as carbon dioxide and can remain in the atmosphere for long periods. According to the Alliance for Responsible Atmospheric Policy (ARAP), there are two aspects to global warming that must be considered when selecting a refrigerant. One is the GWP of the refrigerant compound itself, if emitted. Another concern is the amount of energy consumed to operate the equipment. Lesage does what it can to optimize the latter. The company might not be doing R&D into the chemical side of refrigeration, but they are designing ways to make the energy-consumption component more efficient, saving money and the environment. After five decades in the business, Lesage Inc. has to be doing something right. After all, the company is considered one of the 100 Largest Companies in the Construction Industry by the Office of the Québec construction. Expect to hear more about Lesage, as the company’s experienced engineers and technicians accommodate all projects and innovate for the future.